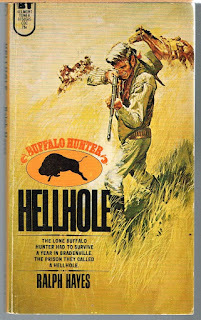 The Leisure first edition version from 1973 lists “Hellhole” as 'Buffalo Hunter' number one (note Belmont Tower also released the book with a different cover in 1973). It's in bold black ink on page three. We know from front cover images floating on used online sellers that 1973's “Four Ugly Guns” has a clear “#2” printed with the series logo on the cover. However, there's evidence that states the first printing was in 1970. It would seem as if it was released first, yet later the publishers deemed it as second in the series. The same can be said for 1973's “Gunslammer” (aka “Secret of Sulphur Creek”) boasting a “#3” on it's cover and evidence of an original printing in 1970. 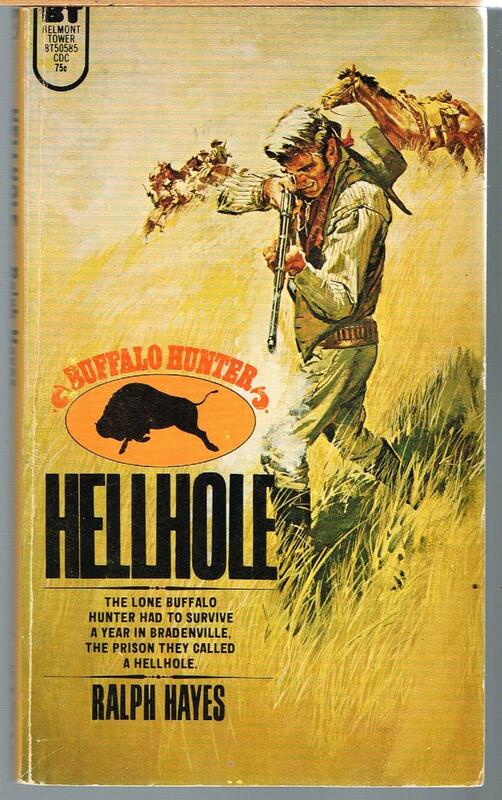 I'm not sure why the publishers would have flipped the series order, but the author advised me the correct order is "Gunslammer", "Four Ugly Guns", "The Name's O'Brien" and this fourth book, "Hellhole". Deep online excavating shows a title called “Hunter's Moon” released by Lenox Hill Press in 1971. The blurb from that states, “The days of the buffalo hunters are recreated in this novel about a man named O'Brien”, the series protagonist. For some reason, the publishers failed to include this book in the series. It doesn't achieve a numerical place in the series chronology and seemingly has been skipped. 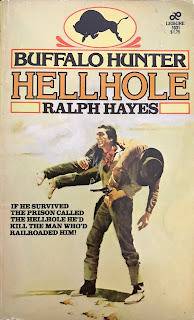 Robert Hale Limited also released a version of the book in 1974 and apparently didn't include a number or any indication it was part of a series. Regardless of how we approach the series, or in what order we read, “Hellhole” is a very enjoyable western novel. The opening chapter has O'Brien fingered as the man who murdered two men and a young girl. The reader knows the Latimer gang committed the atrocity, we were there. But the backwoods sheriff and deputy don't, thus a harsh and speedy sentencing that puts O'Brien in hard labor at the notorious Bradenton prison. Two-thirds of the book is the brutal day to day of O'Brien overcoming adversity and finding reason to rise and exist each day. He's put under torturous conditions by the sadistic prison warden and forced to fight for meals while mining underground for long, grueling hours. The plot develops into the inevitable “escape and payback” routine but Hayes smoothly builds the tension and mood. Will he escape? Where does he run? Who's Latimer? These are all questions that both the reader and O'Brien pose. Hayes sorts it all out for us, but paces the story effectively that we just snack to fill up. Fans of brisk, yet calculated westerns should love “Hellhole”.